Special VIOLET Vinyl edition, limited to 300 copies. Second Still is a post-punk band from Los Angeles, CA – their debut on Manic Depression was a MASSIVE success. 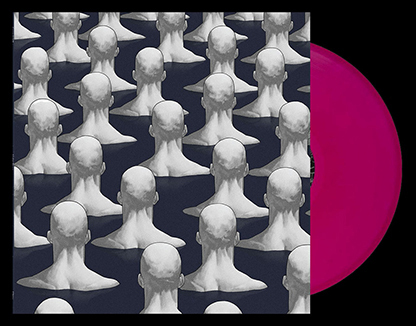 They are now back with the eagerly awaited follow-up, on Greek cult label Dead Scarlet (CD) / Fabrika (Vinyl). While their roots are grounded in 80’s darkwave and French coldwave, the band’s sound has evolved to combine their 80’s inspired foundation with modern electronic elements and nods to pseudo-conventional pop songs. Alex Hartman and Ryan Walker met vocalist Suki Kwan in New York in 2015. The trio has since released 2 EPs [Early Forms, 2016 & Equals, 2018] as well as an eponymous debut LP in 2017. Second Still’s sophomore full-length, Violet Phase was written in the winter of 2018/19 in Joshua Tree and Idyllwild, California. While the songs from this newest release retain the power and intensity of the band’s previous 3 releases, Violet Phase sees Second Still evolving their sound and progressing forward into uncharted sonic territory. The synthesizer moves to the forefront, creating pulsating bass patterns, atmospheric ambient soundscapes, and captivating lead hooks. Elements like saxophone, violin, and choice samples underscore the more experimental approach to songwriting for Violet Phase. By combining these new elements, and blending them together with their post-punk and coldwave foundation, Second Still casts conventional genres aside to create an entirely new and original imprint. Second Still will be on their third European tour to debut Violet Phase in May and June, 2019.